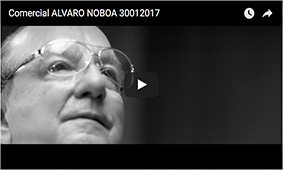 In the live interview that Alvaro Noboa had with Ismael Cala at CNN, he denounced the political persecution he is sufferin; a political persecution led by the Ecuadorian President, Rafael Correa, using the SRI (Ecuadorian IRS). Noboa states that he is one of the persons that pays the highest taxes and that he owes nothing to the state. I am the person that pays more taxes at personal level and Grupo Noboa is the company that pays most taxes as a company. But now I want to tell the world that Exportadora Bananera Noboa is being charged for the year 2005, 49 million dollars in taxes plus penalties and interests. While at the same year, Dole was charged only 780 thousand, and Chiquita only paid 35 thousand dollars. Tell me if that is not a political persecution. Additionally, the SRI director, ordered by Rafael Correa, because let’s be honest, Correa is the owner of this circus and the other is just a henchman that spends hours talking bad about our company. And he also goes to the courts to disallow us to defend ourselves. That is persecution.